You have a dream job in mind. Now you just need to know what degree will take you there. Let Briar Cliff University guide your path. Choose from over 30 traditional degree programs, or create a multidisciplinary degree that merges core classes from multiple majors to design a degree tailored to your needs. 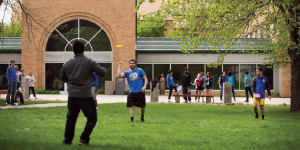 With small class sizes, state-of-the-art classrooms, personalized attention from your academic advisor, and numerous professional opportunities, you’ll discover your passion and become a valuable member of the Briar Cliff community. You can learn a lot about life--—and yourself-—by helping others. Our students participate in thousands of hours of community service annually. Be part of a campus community that encourages you to explore your faith and grow in a way that is right for you. 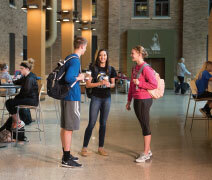 Rooted in a Catholic Franciscan heritage, Briar Cliff challenges its students to grow in self-awareness and in their relationships to others and to God. Make Briar Cliff your home away from home. Step up to the height of the city and live among the beauty of the rolling hills of Sioux City, Iowa. Join our vibrant and inclusive community and experience city life with the safety and comfort of home in our newly renovated dormitories and apartment-style residence halls. Academics may be the cornerstone of any collegiate program, but plenty of learning takes place outside the classroom. Get involved in residence hall events, campus activities and organizations, intramurals, religious life, athletic teams, campus jobs, internships, and community service. At Briar Cliff, you have the opportunity to experience it all. You matter here. Apply today at briarcliff.edu.